Before the Nazis came, Jews accounted for almost two-thirds of Oswiecim’s then 12,000 population. Not a single Jew lives there now. A student who has taken a trip sponsored by the Lessons from Auschwitz project commented on a previous post on my blog, disputing my statement that there is currently no Jewish community in Oswiecim. A disbelieving hush descends on the Home Counties sixth-formers touring the Auschwitz memorial and museum as they enter a room housing a mountainous display of human hair – equivalent to that shorn from 40,000 women, their Polish guide explains quietly. Notice that the hair is decomposing. 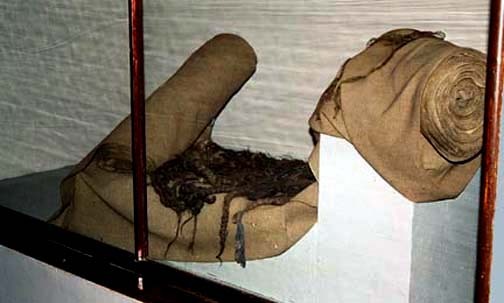 Human hair does not decompose. This hair has been treated with chemicals to kill any lice that may have been in the hair. The hair was shorn from the heads of all the prisoners, women and men alike, the moment that they arrived at Auschwitz, so as not to bring in lice that spreads typhus. In spite of all the precautions that were taken by the Germans, there were two typhus epidemics at the Birkenau camp which caused thousands of deaths. But it was nothing like the epidemic during World War I, in which 4 million people died from typhus in Poland. Did the Polish guide really say that to the students? No, of course not. Students are led to believe that the hair was shorn from the women in order to humiliate them and to obtain hair that the Germans could use to make cloth. The latest group takes participation in Lessons from Auschwitz beyond the 15,000 mark. The final elements of the programme – which is supported by the government and the Welsh and Scottish administrations – are a post-trip seminar and taking what they have learned into their schools and beyond. Note that Susan Pollack was taken to Auschwitz-Birkenau and then transferred. Birkenau was a transit camp, as well as a death camp. That explains why there are so many Holocaust survivors alive today. There was a typhus epidemic at Bergen-Belsen in the last months of the war and Susan may have been “virtually a corpse” because she had typhus. I would never have gone to see The Artist, if it had not won five academy awards including awards for best picture and best actor. Who wants to see a French, black and white, silent film? Not me! The film is actually a silent film about the making of silent films. A very interesting concept. The Artist won the award for Best Original Music Score. I usually don’t pay any attention to the musical score in a movie since I know nothing about music. Since this is a silent movie, one can’t help but notice the music; I liked the music very much. Dujardin also does some tap dancing in the movie. He is no Fred Astaire but he did very well. Dujardin’s part in the movie seems to be modeled on actor John Gilbert, who was a big star in silent films, but didn’t make the transition to talkies. In the movie, the leading man, George Valentin, played by Jean Dujardin, falls in love with the leading woman, Peppy Miller, played by Bérénice Bejo. This actually happened when John Gilbert fell in love with Greta Garbo in a movie script, and also fell in love with her in real life. Allegedly John Gilbert didn’t make it in the talkies because he had a high voice. This is not part of the plot of The Artist. There were many good performances in this picture, especially the part of Peppy Miller played by Bérénice Bejo. John Goodman does a good job of playing a studio boss. The dog named Uggy steals the show. I went to see The Artist in an old-time movie theater which used to show silent movies. The theater had the original seats from the 1920s and the theater looked like the theater that is shown in the movie. The orchestra pit in this old theater is now used for seating of people in wheel chairs. The Artist is not a completely silent movie. There is some sound and of course, there is music playing most of the time. During the sections where the film is completely silent, one could hear the rustle of popcorn bags and the clearing of throats. About ten minutes into the movie, someone in the audience started snoring very loudly. Mercifully, someone woke him up, but about 20 minutes later, he started snoring again and was escorted out of the theater. In addition to the man who could not stay awake during this movie, there were two men who walked out while the movie was playing. The entrance to the theater was in the front, so everyone could see the long walk out of the theater. Very disconcerting, to say the least. Mark Bridges won an award for best costumes in The Artist. The costumes were from the 1920s, of course. I didn’t pay much attention to the costumes, but I liked the fact that a lot of old stuff from the 1920s was shown. There was an old Speed Graphic camera with a vintage flash gun. Also, some old microphones and recording equipment, an old refrigerator, and a lot of old cars. Everything was authentic 1920s, right down to the handle on a casement window. Anyone who loves antiques will enjoy this movie. I think that The Artist is a picture that will mainly appeal to older people. Young people will probably not enjoy it and might even walk out, as two people did when I saw the movie. Shame on them! Has the gallows, on which Rudolf Hoess was hanged at Auschwitz, been moved? We stood outside the house of Rudolf Hoss, (sic) effectively the manager of the camp, where he lived with his family just a few hundred yards from Block 11. Outside it stands the gallows he was hanged from in 1947. Our HET educator for the day, Nicole Sarsby, challenged us to think of how this man was able to bring up his family in such circumstances. The name of the first Commandant of Auschwitz was Rudolf Hoess. (In German the name is spelled Höß or Höss.) Hoess was an officer in the SS; he had received his training at Dachau and had then been assigned to the Sachsenhausen camp before becoming the Commandant of Auschwitz in May 1940. You can read here about the numerous statements made by Rudolf Hoess in which he confessed that millions of Jews were gassed at Auschwitz. 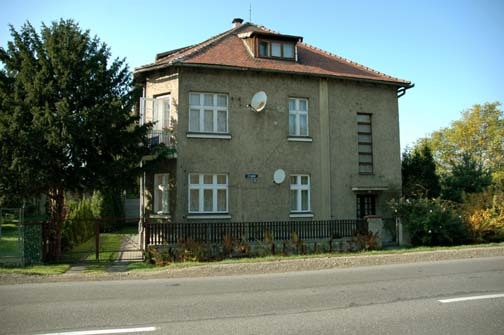 The house where Rudolf Hoess lived is shown in the two photos below. The house where Rudolf Hoess formerly lived with his wife and children is now occupied by new residents. I took the photo above in October 2005. I wonder what the current residents think about the hundreds of British students parading past their home, gawking at the reconstruction of the gallows where Rudolf Hoess was hanged. Note that I took the photo from across the street, so as not to invade the privacy of the current occupants. 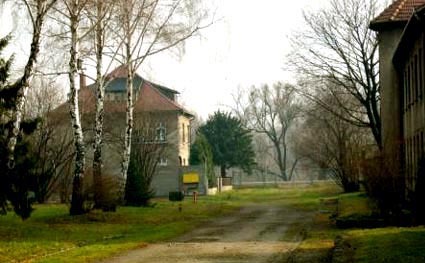 The article written by Mike Pyle mentions that the house where Rudolf Hoess lived was “just a few hundred yards from Block 11.” The photo below, which I took in September 1998, shows Block 11. 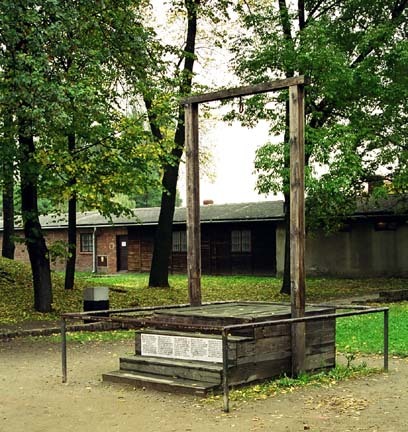 When I visited Auschwitz in 2005, a reconstructed model of the gallows on which Rudolf Hoess was hung, was located near the gas chamber building in the main Auschwitz camp. The Auschwitz complex was targeted by the Allies, not because the Jews were being gassed there, but because the factories near the camp were extremely important to the German war effort. In 1944, the Auschwitz main camp received a direct hit from Allied bombs and one of the barracks buildings was damaged. I’m confused. Has the reconstructed gallows now been moved from this spot? Was it moved because tourists are now shuffled through the gas chamber from the other side of the building, not from the door on the side where the reconstructed gallows was located when I visited the camp in 1998? The photo below shows the door into the gas chamber building that was constructed when the gas chamber was converted into an air raid shelter. When I visited Auschwitz in 1998, I was told that this was the door through which the victims entered the gas chamber. 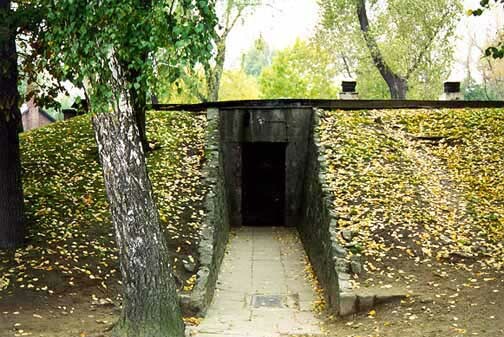 At that time, tour guides were still telling visitors that the gas chamber was original, not a reconstruction done by the Soviet Union. The door shown in the photo below was not there when the gas chamber was in operation. Our day started, after an early flight into Krakow, in the nearby town of Oswiecim. The Nazis chose to build Auschwitz there because it had one of the largest Jewish populations in the country – 68 per cent of the population, around 7,000 people. Wait a minute! The Nazis chose to build the Auschwitz camp in Oswiecim because there were already 7,000 Jews there and they would not have to transport them to another place? I don’t think so. Before the German invasion of Poland on September 1, 1939, Oswiecim was a town with a population 12,000, of which 7,000 residents were Jewish. 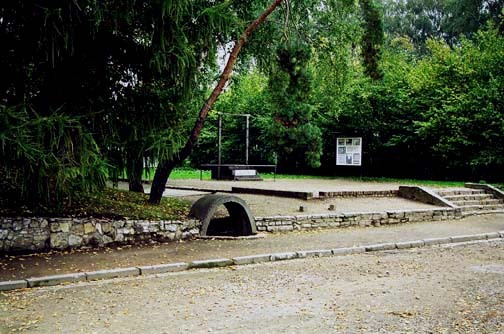 The Jews, who had lived for over 500 years in the town, which they called Oshpitzin, were evacuated by the Nazis to three different ghettos in 1941, but eventually ended up back at Auschwitz, where most of them perished in the Auschwitz II death camp. The plan to establish a concentration camp at Auschwitz was first announced by Reichsführer-SS Heinrich Himmler on April 27, 1940. Konzentrationslager Auschwitz, the main camp, was originally opened on June 14, 1940, as just another concentration camp, in the former Polish military garrison in Zazole, a district of the town of Auschwitz. Thirty German criminals, who were prisoners in the Sachsenhausen concentration camp, were brought to Auschwitz in May 1940 to convert the garrison into a prison camp. Throughout its existence, the Nazis called Auschwitz a concentration camp, not an extermination camp or Vernichtungslager. The term “extermination camp” was coined by the Allies and initially, it applied to all the Nazi camps. At first, the Auschwitz main camp, known as the Stammlager, was only a camp for Polish political prisoners, including some Jews, and German common criminals, who assisted the Nazis in supervising the other prisoners. The first transport to the Auschwitz concentration camp consisted of 728 Polish inmates of the Gestapo prison at Tarnow. They were mostly university students, including a few Jews, who had joined the Polish Resistance. The Polish Army never surrendered to the Germans and no Armistice was ever signed. The Poles continued to fight during World War II, but as insurgents or illegal combatants, not as soldiers on the battlefield. 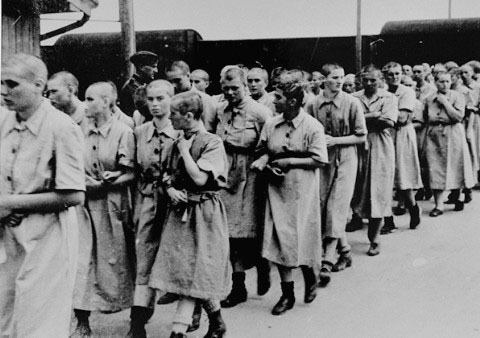 When captured, the Polish resistance fighters were sent to Auschwitz or other concentration camps such as Buchenwald and Dachau. Hoess was relieved of his duties as Commandant of Auschwitz-Birkenau in 1944 and sent to Oranienburg to replace Arthur Liebehenschel as the Senior Director of WVHA, the SS Economic Department. On December 1, 1944, Liebehenschel became the new Commandant of Auschwitz, but only the Auschwitz I camp, not the whole Auschwitz-Birkenau complex. Hoess was fired because he was allegedly having an affair with a woman prisoner in Block 11 at the Auschwitz I camp. The woman, Eleanore Hodys, told her story to the American liberators at Dachau and it was included in a book entitled Dachau Liberated, The Official Report by The U.S. Seventh Army. In the book, she was identified only as E.H.
Dr. Georg Konrad Morgen, an SS judge who was assigned to investigate corruption in the Auschwitz camp, allegedly learned of the affair and fired Hoess from his position as Commandant of Auschwitz-Birkenau. Hoess returned to Auschwitz in April 1944 to supervise the gassing of the Hungarian Jews at Auschwitz II, aka Birkenau. 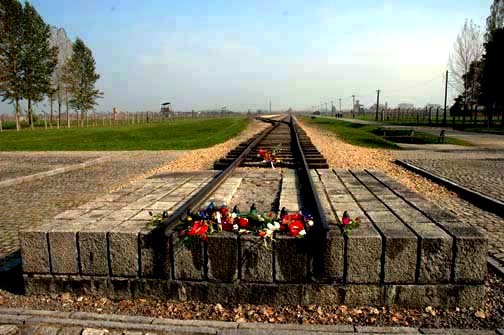 He was the one who ordered that the train tracks be extended inside the Birkenau camp, right up to the gas chambers in Krema II and Krema III. I have deduced that the British students are given the standard spiel of misinformation about Auschwitz, including all the common mistakes included in the Holocaust story. They are probably told that Rudolf Hoess was put on trial at Nuremberg and that he confessed. I doubt that the students are told that Hoess was tortured by the British until he confessed. 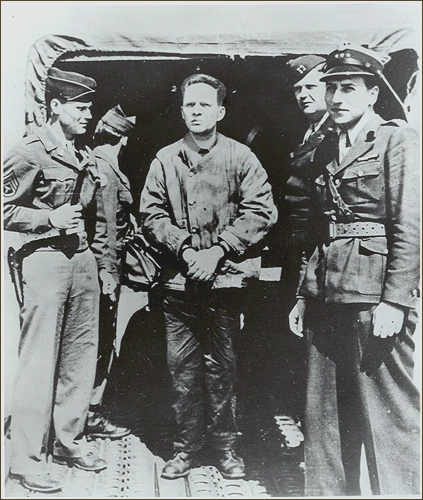 Rudolf Höss was arrested by the British near Flensburg, Schleswig- Holstein, Germany on March 11, 1946. He was turned over to the Supreme National Tribunal in Poland on May 25, 1946 and was put on trial in 1947. He was convicted and sentenced to be hanged. Three months after he was hanged at the main Auschwitz camp, the former camps at Auschwitz and Birkenau officially became the Auschwitz-Birkenau Museum. The British were able to find Rudolf Hoess, after he had been hiding on a farm for eight months, because they contacted his family and threatened to turn his son over to the Soviet Union to be sent to Siberia unless they revealed his hiding place. On March 11, 1946, at 11 p.m., I was arrested. My vial of poison had broken just two days before. The arrest was successful because I was frightened at being awakened out of a sound sleep. I assumed that it was a robbery because there were a lot of them occurring in the area. I was treated terribly by the [British] Field Security Police. I was dragged to Heide and, of all places, to the same military barracks from which I had been released eight months before by the British. I do not know what was in the transcript, or what I said, even though I signed it, because they gave me liquor and beat me with a whip. It was too much even for me to bear. The whip was my own. By chance it had found its way into my wife’s luggage. My horse had hardly ever been touched by it, much less the prisoners. Somehow one of the interrogators probably thought that I had constantly used it to whip the prisoners. After a few days I was taken to Minden on the Weser River, which was the main interrogation center in the British zone. There they treated me even more roughly, especially the first British prosecutor, who was a major. The conditions in the jail reflected the attitude of the first prosecutor. Surprisingly, after three weeks I was shaved, my hair was cut, and I was allowed to wash myself. My handcuffs had not been opened since my arrest. The next day, I was taken by car to Nuremberg together with a prisoner of war who had been brought over from London as a witness in Fritsche’s defense. Compared to where I had been before, imprisonment with the IMT [International Military Tribunal] was like staying in a health spa. At the Nuremberg International Military Tribunal, Rudolf Hoess was called as a defense witness by Kurt Kauffmann, the lawyer for Ernst Kaltenbrunner, on April 15, 1946. This “opened the door” for an affidavit signed by Hoess to be entered into the proceedings of the Nuremberg IMT and gave the prosecution the opportunity to cross-examine Hoess on the witness stand on April 15, 1946. The first confession signed by Hoess was labeled by the Allies as Nuremberg Document No-1210. It was an 8-page typewritten document written in German. Hoess wrote the date 14.3.1946 2:30 (March 14, 1946 2:30 a.m.) next to his signature. This date was three days after his capture on March 11, 1946. Hoess had been beaten half to death; alcohol had been poured down his throat, and he had been kept awake for three days and nights before he finally signed this confession at 2:30 in the morning. A second affidavit signed by Rudolf Hoess on April 5, 1946 was labeled by the Allies at the Nuremberg IMT as document PS-3868. It was a typewritten document, about 2 and a quarter pages long, written in English. A second document, also labeled PS-3868, was purported to be the English translation of the original deposition given by Hoess in German. The second document was the one that was entered into the proceedings of the Nuremberg IMT. 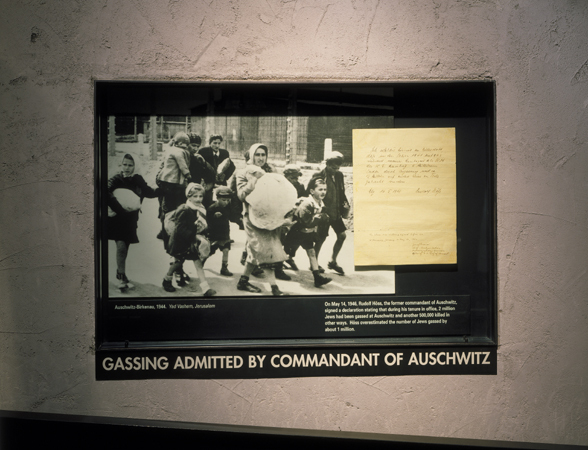 A copy of one of the confessions given by Hoess, after he was tortured half to death, is displayed at the United States Holocaust Memorial Museum. The photo shows Jews walking to the gas chamber, carrying their bundles. I was surprised at the great interest in my post yesterday about the student trips to Auschwitz which are funded by the Holocaust Educational Trust. I am very much against the practice of sending 16-year-old students on a whirlwind tour of a historical place, where they do not learn even the most basic facts. As I pointed out in my post yesterday, the students are told that Auschwitz was re-named by the Nazis when they took over the town during World War II. The most basic fact about Auschwitz is that the town was founded by Germans in the year 1270. The British students are not taught this on their one-day trips. We had briefly touched on the subject in our earlier years of education, but the overriding feeling was that we were not entirely sure what to expect; how can censored lessons serve to prepare you for the stark reality of a camp which was purpose-built to murder millions? Note the mention of “censored lessons.” To what is this student referring? The students have CENSORED LESSONS to prepare them “for the stark reality of a camp which was purpose-built to murder millions”? What camp was “purpose-built to murder millions”? Was this student referring to Auschwitz-Birkenau as a camp that was “purpose-built to murder millions”? Himmler visited Auschwitz in March 1941 and commanded its enlargement to hold 30,000 prisoners. 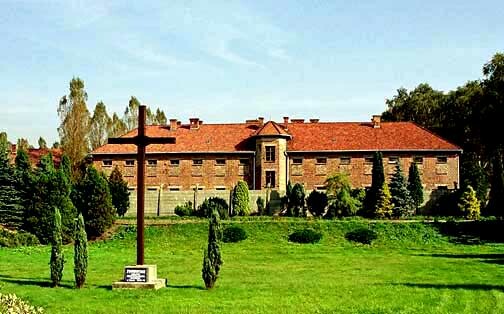 Himmler also ordered the construction of a second camp for 100,000 inmates on the site of the village of Brzezinka (Birkenau), roughly 4 km from the main camp. This massive camp was intended to be filled with captured Russian POWs who would provide the slave labor to build the SS ‘utopia’ in Upper Silesia. The chemical giant I G Farben expressed an interest in utilizing this labor force, too. Extensive construction work began in October 1941, under terrible conditions and with massive loss of life. About 10,000 Russian POWs died in the process. Sixth-formers from across Wales have paid a visit to Auschwitz as part of a project to educate people about the horrors of war. More than a million people were killed by the Nazis at the concentration camp in present day Poland. Students visiting the site with the Holocaust Education Trust told BBC Wales what they thought. The recording starts off with a tour guide in Krakow telling the students that they are first going to make a 30 to 40 minute stop in the town of Oświęcim, not Auschwitz; she tells the students that Oświęcim was RENAMED AUSCHWITZ BY THE NAZIS during the war. What did the students learn from this trip? They learned how to pronounce the words Oświęcim and Auschwitz correctly from people who speak Polish. Other than that, they learned that it was “so cold” in Poland and that the Jews were “stripped before going into the gas chamber,” implying that the victims suffered from the cold because there was no heat in the gas chamber. The gas that was used (Zyklon-B) had to be heated to 78.3 degrees before the poison was released, so this was an obvious blunder on the part of the tour guide. The students learned from the tour guides that the main Auschwitz camp was located in “former Polish military barracks.” But were they told why the Auschwitz buildings were originally built? Were they told that Auschwitz was the largest railroad hub in Europe? All railroad lines in Europe went to Auschwitz which is why this town was selected for a migrant worker camp way back in 1916. The migrant workers lived in what later became the Auschwitz I camp, and went from there to farms all over Europe to harvest the crops. The students were told that 50% of the people in the town of Auschwitz were Jewish before the war and now there are no Jews in the town. Of course, they were not told that Auschwitz was a town in which liquor was produced and shipped to America during Prohibition and also a place that was known as a hub for human trafficking, or “white slavery” as it was called back then (Source: Hitler’s Vienna: A Portrait of the Tyrant as a Young Man, written by Dr. Brigitte Hamann, German-Austian historian, in 1999). The town of Auschwitz was originally built by the Germans in 1270. It was renamed Oświęcim by the Poles when this area was given to Poland after World War One. Why am I nitpicking about these small details? Because the students should be taught HISTORY, not propaganda and hatred of the German people. They should not be told that the Jews were targeted because they were “different.” They should be required to read “Mein Kampf” before getting on a plane to Poland. They should learn about HOW the Jews were different and why Hitler thought that the Jews caused Germany to lose World War One. They should learn that Auschwitz was in Silesia, a province that Germany lost after World War One. A court in Nuremberg overturned the conviction of Bishop Richard Williamson for Holocaust denial on Wednesday, but a new indictment is expected in about five weeks. Although the guilty verdict was set aside on a technicality, Bishop Williamson can be tried again for the same offense. The Higher Regional Court of Nuremberg threw out the original conviction because a lower court failed to specify when and how Bishop Williamson’s remarks were broadcast to the public. You can read more about it here. Bishop Williamson, who is not a German citizen, was originally charged with a crime because of remarks that he made in Germany during an interview with a Swedish broadcaster who put a video of the interview on the Internet where it could be seen in Germany. 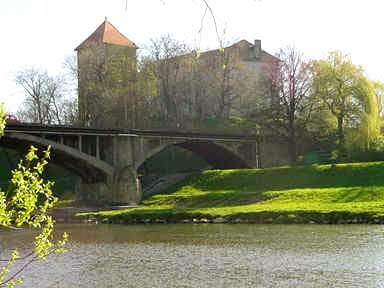 The interview took place in Regensburg, Germany in 2008 and was shown on Swedish television. Bishop Williamson gave permission for the interview to be shown in Sweden, which does not have a Holocaust denial law, but he did not give permission for it to be shown in Germany. In 2010, a court in Regensburg found Bishop Williamson guilty of inciting hate and fined him around $14,000. The fine was later reduced to around $9,000. The higher court in Nuremberg has now ruled that the Regensburg court failed to meet the formal prerequisites for prosecution. Bishop Williamson might have to face trial again, but what will happen to the Swedish guy who set him up? Nothing, of course. It is not a crime in Germany for someone to set up a person to be arrested for Holocaust denial. Let this be a lesson to all you people living in a free country somewhere. If you go to Germany, don’t even say the word Jew, or you might be arrested and thrown into prison for five years. You never know if someone might be recording your remarks and setting you up to be tried as a criminal. Is the spirit of Anne Frank hiding in an attic in Mormon spirit prison? It was reported today by Haaretz that the Huffington Post claims that “Holocaust victim Anne Frank was baptized posthumously by a Mormon.” According to Mormon belief, the spirit of a person who is baptized after death has the option to accept or reject Mormon baptism. I previously blogged about Mormon heaven here. I am sure that the spirit of Anne Frank is hiding somewhere in a spirit attic in spirit prison, so that she will not be dragged into Mormon heaven against her will. Anne could never spend eternity with the Mormons — she will always be a Jew. 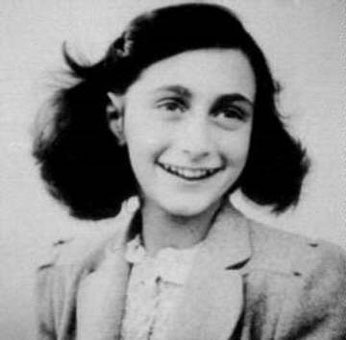 I previously blogged here about what Anne Frank might have written if she had continued writing her diary after her hiding place was found. I have written a detailed description of Anne’s hiding place on my website here. Comments Off on Is the spirit of Anne Frank hiding in an attic in Mormon spirit prison? What really happened at Bergen-Belsen? Can you say “typhus”? Today, survivors of Bergen-Belsen, like Eva Olsson, go around telling innocent 10-year-old schoolchildren in American and Canada that there was a gas chamber at Bergen-Belsen and that children were burned alive when the Germans ran out of pellets for the gas chamber. I previously blogged about Eva Olsson here. Olsson herself had typhus while she was at Bergen-Belsen. As most people in the world know, Anne Frank and her sister Margo both died of typhus in the camp. 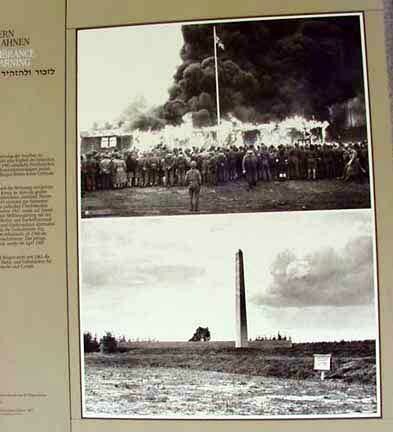 I took the photo above in the Bergen-Belsen museum in May 2002; it shows the British liberators of the camp burning down all the buildings in the camp, as this was the only way to stop the typhus epidemic in the camp. You can read more about Bergen-Belsen here. A Documentation Center and an exhibition on the history of the camp was first opened at Bergen-Belsen in 1966. 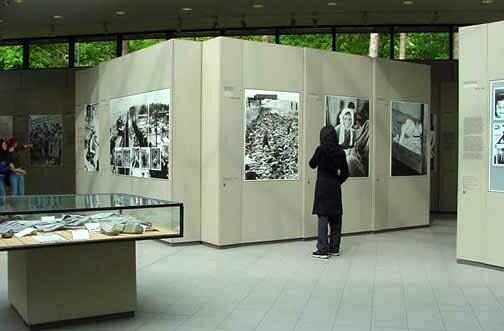 A new permanent exhibition was opened in April 1990. 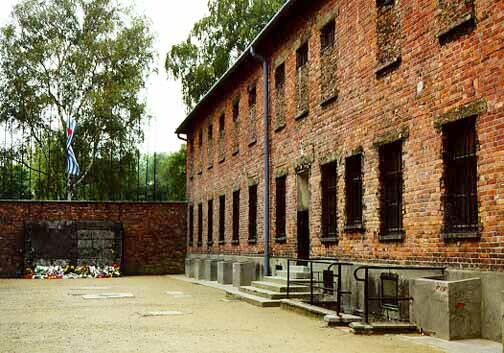 The photo below shows the Bergen-Belsen museum as it looked in 2002 when I visited the Memorial Site. I did not see the graph shown in the photo above in the museum in May 2002. 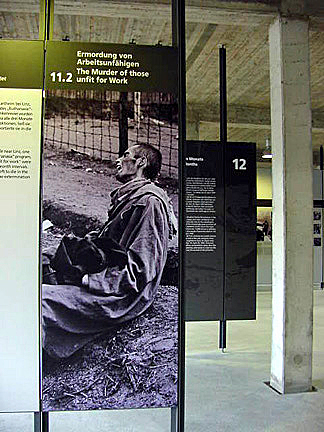 On October 28, 2007, a new museum, devoted to the survivors, opened at Bergen-Belsen. 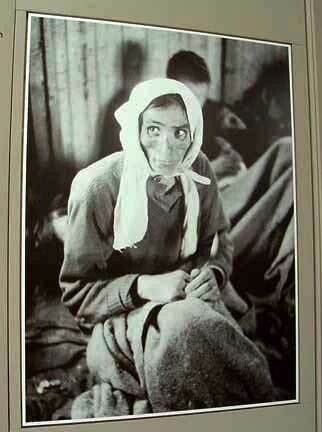 The photo above, which I took at the old Bergen-Belsen museum in 2002, shows a sick woman who is in the “Typhoid barracks.” Typhoid is usually spread by drinking contaminated water. The water pump at Bergen-Belsen had been destroyed when the Allies bombed the camp near the end of the war. The British liberators pumped water out of a creek for the survivors when they took over the camp. 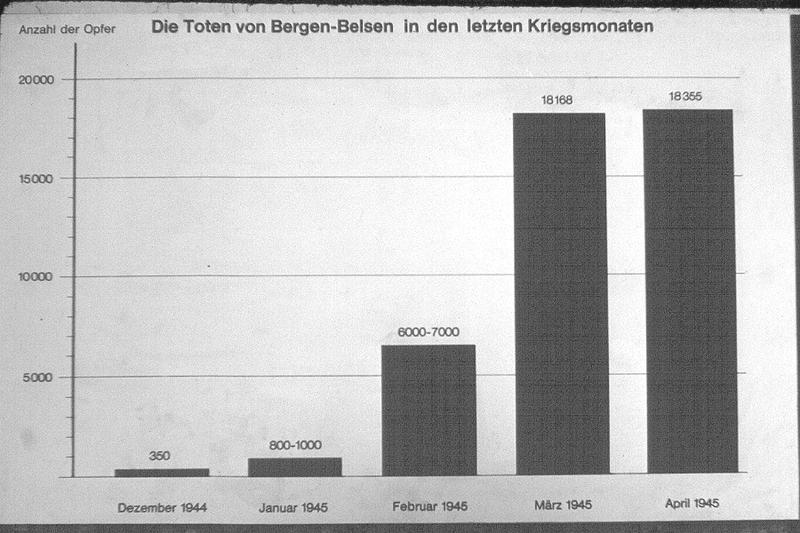 The death statistics at Dachau were similar to those at Bergen Belsen because both camps had a typhus epidemic near the end of World War II. Paul Berben, a prisoner in the camp, wrote a book entitled Dachau, the Official History 1933 – 1945, in which he stated that 2,888 prisoners had died at Dachau in January 1945; 3,977 prisoners had died in February; 3,668 had died in March and 2,625 had died in April, for a total of 13,158 in the first four months of 1945. There were 31,951 deaths at the main Dachau camp during the 12 years that the camp was in existence, according to a report made by the International Tracing Service at Arolson, Germany in 1977. The Tracing Service is part of the International Red Cross. This report was based on death records meticulously kept by the Nazis. 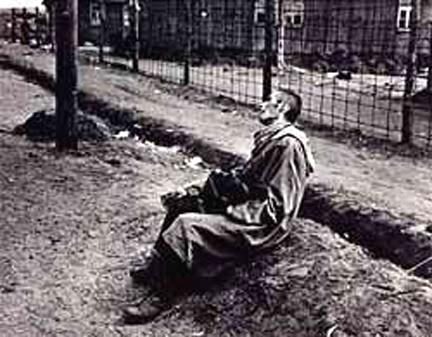 The increase in the number of deaths at Dachau, in the last 4 months that the camp was in operation, was due to a typhus epidemic which got started in December 1944 when prisoners were “death marched” out of the camps in the East and brought to Germany. Unfortunately, typhus was also brought from the camps in the East to Bergen-Belsen. Carolyn Yeager has a blog with the title Elie Wiesel Cons the World and the sub-title A website dedicated to exposing the false testimony of the world’s most famous Holocaust survivor. Her latest article is a detailed explanation of the changes that Marion Wiesel, the wife of Elie Wiesel, made to the book Night in order to make the book into a “memoir” in which the dates in Elie’s “novel” now conform to what was actually happening in the real world. I had not realized the significance of these changes until I read the blog post, dated February 17, 2012 by Ms. Yeager. The book Night was changed because Oprah made it her book club selection and advertised it as a “memoir.” I recall that Elie Wiesel had a website at that time, on which he referred to Night as a “novel.” The changes made the “novel” into a “memoir.” Ms. Yeager has explained all this very clearly on her website (which I call a blog). In other words, the 1955 Yiddish version, the 1958 French version, and the 1960 English version (of Night) generally agree—only the “corrected” 2006 translation (by Marion Wiesel) is different. So, are these really errors of translation that Marion Wiesel is fixing for us? Or are they not simply problems for Elie Wiesel? Under close scrutiny, the Elie Wiesel narrative has huge holes which bring up embarrassing questions, and this is what Marion Wiesel’s new translation was meant to head off. Elie Wiesel’s Nobel prize should be taken away from him and given instead to Carolyn Yeager for the amazing work that she has done in exposing him as a fraud. Does Holocaust education inadvertently fuel anti-Semitism? 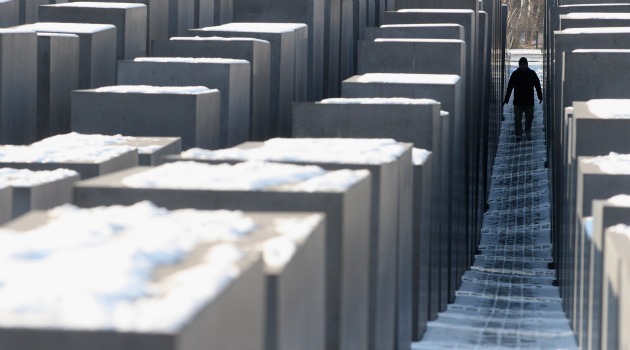 An article by Dan Fleshler in The Jewish Daily Forward with the headline “Does Education Fuel Anti-Semitism?” informs us that “a German study says Holocaust studies may increase hatred (of Jews).” The photo below of the Jewish memorial in Berlin accompanies the article. Imagine having a 4.7-acre field of huge concrete blocks a few yards from the Capitol building in Washington, DC. 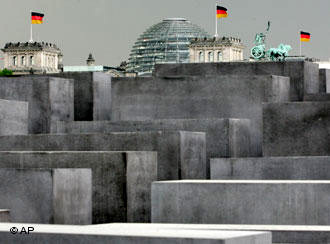 The photo below shows a view of the German Reichstag behind the Jewish memorial in Berlin. Is the same thing happening in America? Are students in American schools hearing too much about the Holocaust in the classroom? Is the whole world suffering from Holocaust fatigue? Enough already! Eva Olsson, an 87-year-old Holocaust survivor who now lives in Canada, gives many lectures to students in which she tells them about the gas chamber in Bergen-Belsen and that children were burned alive at Bergen-Belsen. 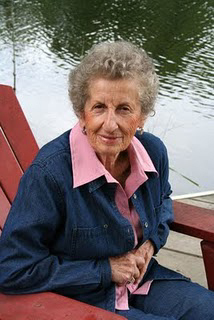 In November 2008, Eva Olsson, who was born into a family of Hasidic Jews in Satu Mare, Hungary, told an audience of 550 delegates to the Upper Canada District School Board’s ACT Now! Symposium in Cornwall that she was sent to the Auschwitz-Birkenau death camp on May 19, 1944; she was later transferred to Bergen-Belsen in Germany. Eva Olsson and her younger sister Fradel were the only members of her extended family of 89 people who survived the Holocaust, according to her story, published in a news article in the Seaway News on November 6, 2008. Olsson told the story of her experiences as a slave labourer at a German munitions factory, and as a prisoner in Auschwitz and Bergen-Belsen in 1944 and 1945. As people sat at the Nav Canada Training and Conference Centre trying to hold back tears, she spoke of how she witnessed her mother and three young nieces being led away to the gas chambers on their arrival to Auschwitz, never to be seen again. The room fell silent as Olsson told of witnessing firsthand the horror of the “death factories” created by the Nazis. She told stories of German soldiers being ordered to shoot babies in their mother’s arms-killing both mother and child-to not waste two bullets. She spoke of seeing the Angel of Death-Dr. Josef Mengele-and the hospital where he experimented on young Jewish children by infecting them with diseases such as tuberculosis. Perhaps the most gruesome aspect of the tale was her recollection of her imprisonment in Bergen-Belsen when the camp ran out of pellets to fuel the gas chambers. “On that day, five children at a time were put into the (crematorium) ovens alive, five children at a time, to be burned alive,” said Olsson, who contracted typhus in the death camp. There should be a law against telling stories about children being burned alive at Bergen-Belsen. 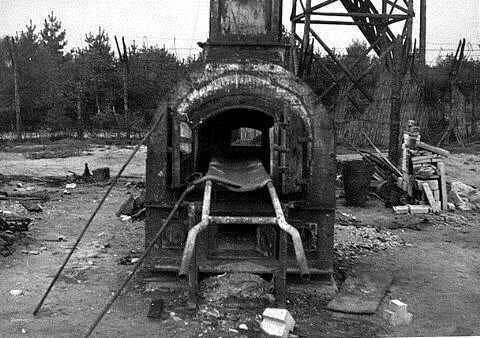 The photo above shows the one and only cremation oven at Bergen-Belsen. Sorry, I don’t have a photo of the Bergen-Belsen gas chamber because, contrary to the Holocaust education given by Eva Olsson, there was no gas chamber at Bergen-Belsen.